The turn of the year is an important time to look both backward and forward. In this issue, we’ll take an updated look at some good layouts we’ve published in the past and see what’s been happening to make them even better. There’s a lot to be learned from watching other modelers work on their displays, so here are 15 layouts you can recall and revisit! Brooklyn 3 AM is a Masterpiece Layout being created by Prof Klyzlr in Sydney, Australia. We’ve been following the progress of this notable work in Scrapbooks #58, #63a, #71 and #74. The layout is set in the middle of the night, after a rainstorm. 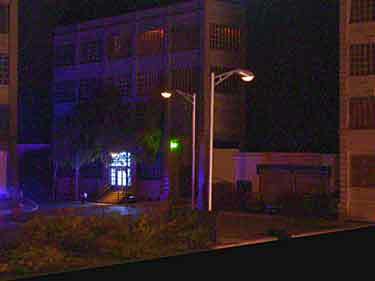 It uses a variety of new techniques to create a mood and enhance its operations, including a virtuoso display of specially-created lighting effects. Prof K took photos of some of the lighting recently, and here they are in pairs—one under “normal” lighting, the other under the layout’s special night lights. 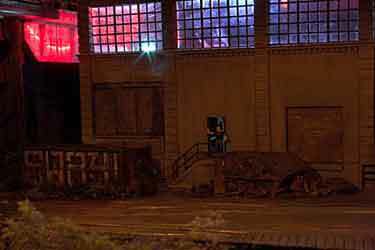 Note the laser-lit “rave” party in one warehouse. 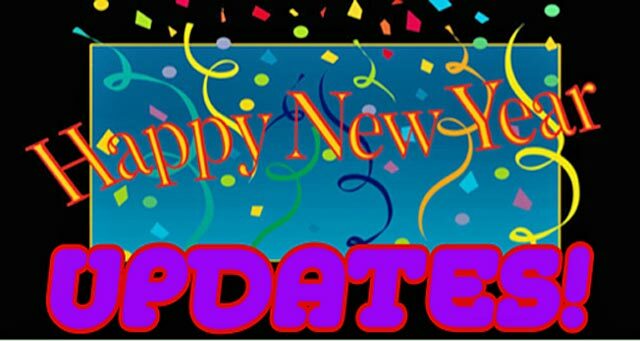 Watch for more developments in future issues! A LATE ENTRY FOR THE ‘WORLD’S SMALLEST LAYOUT’ CHALLENGE! Eric G. Lewis, from Orange County, California USA, writes that he knows the Challenge is over, but “the attached drawing is my idea for the (almost) smallest layout.” In 1:1 scale, the little pike is 60 inches (152cm) in diameter. 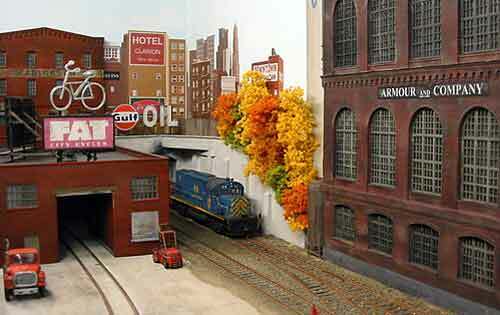 In HO scale, it would measure 1.75cm, or roughly 5/8 of an inch! 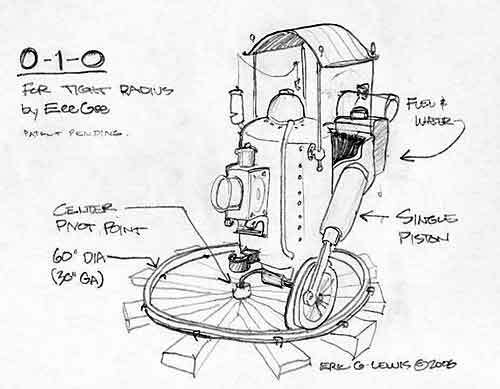 Inspired by either steampunk or the works of Rube Goldberg (U.S.) or Heath Robinson (U.K.), Erik has designed a most unusual 0-1-0 steam locomotive. “The thing could be powered by a small motor under the table with its rotating shaft protruding up to the center pivot point, or by a motor on board turning the piston,” he comments. No prizes for the first photo of a model 0-1-0 we receive and publish! 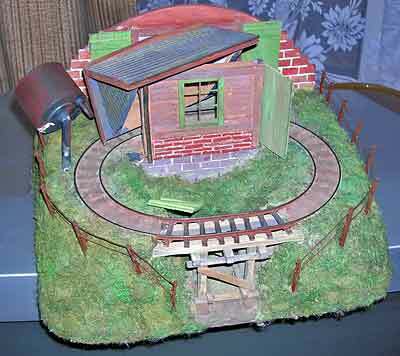 Duncan’s Mine, by Steve Grantham, from Bubwith, North Yorkshire UK, was featured in Scrapbook #74. 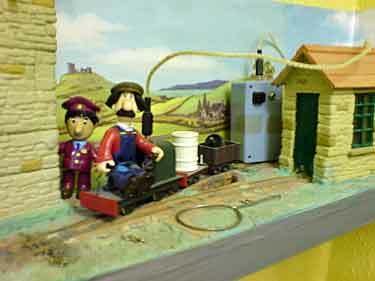 It made its first exhibition appearance in 2008. Reports Steve, “Operationally it was excellent. 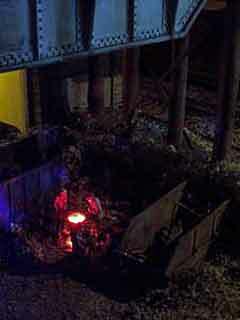 There’s a lot that can be done with three sidings and a sector plate!” Here are some photos. 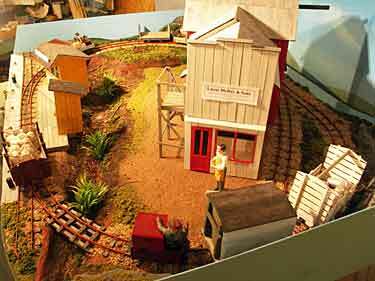 Cannery Row is an appealing layout by Craig Jenne that appeared in Scrapbook #75. It depicts the waterfront of Monterey, California, made famous by John Steinbeck’s novel of the same name. 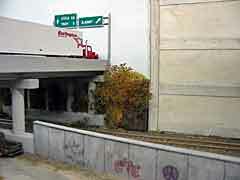 The area can still be visited as a tourist destination. 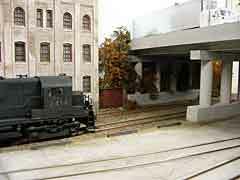 Craig added a hypothetical Trackmobile-powered switching railroad to the area. As so often happens, Shortliner Jack Trollope, from the Highlands of Scotland, was taken with the little line, and found an unusual way to add some extra operating capability to it. The original uses a rotating swivel table to switch from line to line. Jack has added another spur track that crosses in that same location (blue line), substituting a rotating Atlas 19-degree crossing for the simple straight track of the swivel table. By placing a small, hidden cassette at the end of the new spur, Jack has succeeded in providing new complexity and operating possibilities to the layout! Trace out the switching moves possible in this new configuration, and you’ll see how significant this “poor man’s double slip switch” can be! 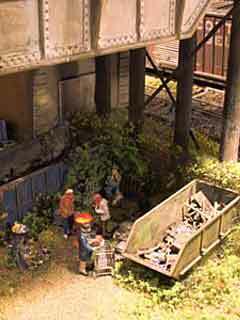 Fat City Terminal RR is a US-style model railroad being constructed by Alexander Lösch, who lives in Elfershausen, Germany. We have seen photos of this delightful layout in Scrapbooks #65a and #73a. 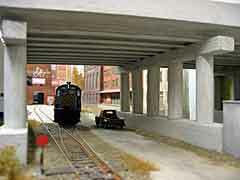 The name derives from the Fat City Bicycle Works, a major source of revenue for the H0 scale, D&H-prototype railroad (see left photo). Alexander has been busily extending the line beyond the bicycle works, as shown in the other photos. There’s more information and pictures at his website. We first encountered Steve Jarman’s little 2x4ft (0.6×1.2m) On30 railway, the Paunsaugunt & Red Canyon RR, in Scrapbook #72a. 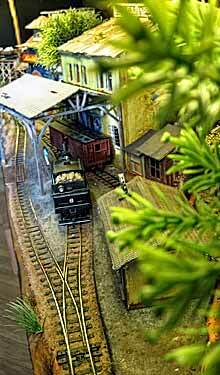 Steve has been busy adding scenery and details to the layout, as shown in the photo below (left). He’s also produced an evocative new video to show off his handiwork (click on the triangle to see the show). Steve lives in St. Louis, Missouri USA. Upbeach St. Mary, a OO layout built originally in two box files (as shown in Scrapbook #72), has doubled its size. 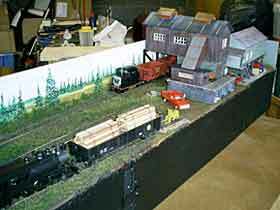 Martyn Mullender, from Portland, Dorset England, has added two new box files, increasing the layout’s length to 74x24cm (29×9½in). 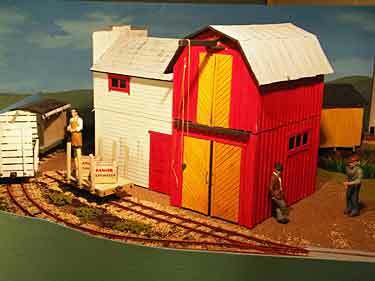 The additions are at each end… a scenic section with a thatched-roof cottage at the right end, and a traverser in the fiddle yard at the other. When the layout is not in use, it’s covered and made dust-free by the box file lids—only the thatched cottage needs to be removed. We’ve been following with great interest the progress of an On30 adaptation of the Darjeeling Himalayan Railway being built by Alexander Kaczmarek, from Berlin, Germany. The layout has appeared in Scrapbooks #53a, #63a and #74. Alexander is focusing now on scenery for the line, which features switchback (zig-zag) operation and measures 210x45cm (83x18in). 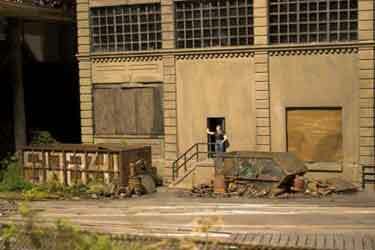 Alexander comments, “I have built three new houses, all scratchbuilt of styrofoam and cardboard. There are still a lot of details to add, but hopefully they all have an ‘Indian-look.’ Also some people are now beginning to crowd the streets.” Looks very good, and quite authentic, to me! 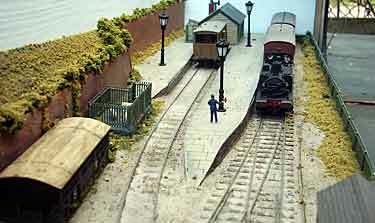 This layout, originally built by Andy Spooner, from Hailsham, Sussex England, was pictured quite recently in Scrapbook #80. Alas, as Andy reported later, it turned out to be the victim of a little-known bug in micro layouts! 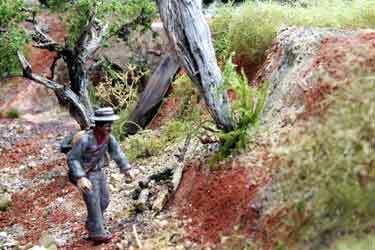 “I have found the biggest drawback with micro-layouts,” Andy writes. “If you put them on a chair while moving things around, it’s very easy to sit on them without thinking!! !” The results are dramatic, as pictured at the left. We’re happy to report, however, that the damage in this case has been easy to repair, and trains are now running happily again on this little test layout. But take warning: this could happen to you! We first peeked at Maldon Market Hill in Scrapbook #59a, where its operating plan provided a good example of the Two Turnout Theme at work in a 48x12in (120x30cm) OO shelf layout. 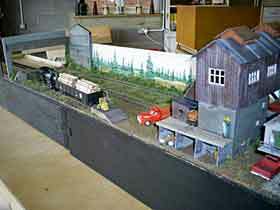 Since that time Andrew Smith, from Chelmsford, England, has dressed up the layout for exhibition. 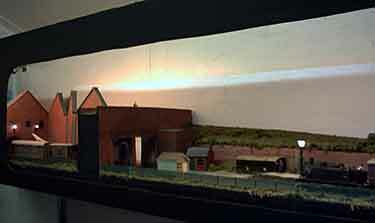 He added a proscenium arch (“picture frame”) with lights behind it, as well as a two-road sector table at the left to expand the fiddle yard operating capabilities, bringing the layout’s dimensions to 66x12in (168x30cm). 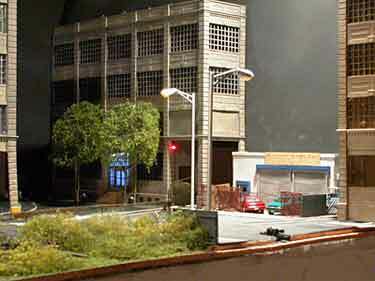 And he placed a variety of the scenic details that bring a layout to life, including working lights in strategic spots (lower left). The track plan continues to serve up excellent, prototypical operation. Lighter Traffic (above) is a 1x3ft (30x90cm) shelf-switcher layout, posted anonymously on RMWeb and inspired by Steve Grantham’s Heavy Traffic (featured in Scrapbooks #57, #59a and #71), which was in turn inspired by several designs on this site, including Two Nooks, by Shortliner Jack Trollope. Now, in a further turn of the screw, Jack has designed several ingenious variations on Lighter Traffic. So here is a fourth-generation update! In the top drawing (at right) Jack adds a single Peco short-radius left turnout to provide an extra spur for increased shunting. The middle drawing shows how to do it with just two turnouts by using a Peco asymmetrical three-way switch (the Code 100 symmetrical switch can easily be substituted). And finally, for those who do not want to build a sector plate, Jack shortens the layout and uses 12in (30cm) Peco Loco Lifts as cassettes in the fiddle yard at left rear! 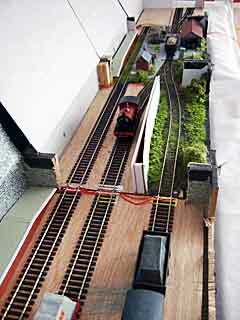 Henrik Laurell, from Gothenburg, Sweden, has declared his Aspendale Wharf layout is finished. 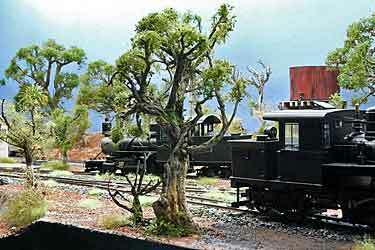 This 7/8n18 scale (1:13.7 on 32mm gauge) effort was featured in Scrapbook #79a. Since we saw it last, Henrik has added a small, colorful industrial building in the center along with lots of small details everywhere. Because of the very large scale, this is a BIG layout, measuring 150x115cm (59x45in). Franck Combe, from Paris, France, has compacted his Gn15 layout design somewhat since we first encountered it in Scrapbook #77. The redesigned layout measures just 100x35cm (39x14in). It’s tentatively planned to be a mining line called Carl Arendt Rock & Limestone Company (CARL Co. for short). Franck plans to use Peco Loco Lifts to fiddle trains in five locations, and his rolling stock will be primarily Bachmann tippers. Notice the lifelike portrait he’s crafted on his logo! Hear, hear! Compare the appearance of Peter’s tiny shelf layout in this photo with the backdrop-less version shown in Scrapbook #51. Fabrice Fayolle, from Amiens, France, has put the finishing touches on his On30/0e exhibition layout, Koonunga Junction. It’s set on an island near Australia, in the Tasman Sea. We first encountered this marvelously scenic layout in Scrapbook #74. Now it’s ready for exhibition and even has an initial video on YouTube (click the arrow below to see the video). 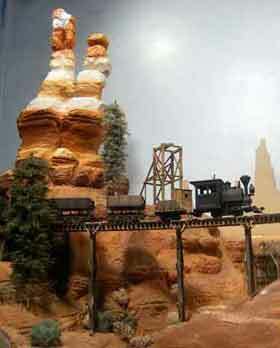 There’s an extensive thread discussing the layout’s construction on the Railroad Line Forums.